Although the term 'bouncing bomb' is synonymous with the Dambusters, ordinary bombs were sometimes known to bounce long distances before exploding. 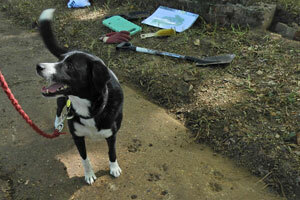 Although there's no crater left, we find other evidence at the scene of an bomb incident. I've seen a few references to ricochet craters in reports; this is where a standard bomb fails to fully penetrate the ground and bounces off the surface, much like a stone being skimmed on water. 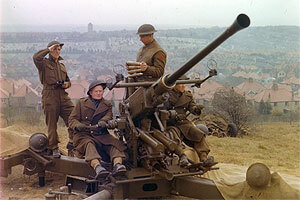 Between June 1942 and April 1943, over 100 incidents of ricochetting bombs were recorded in Southern England, 28 of which were in East Sussex. 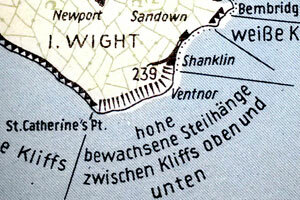 Our story starts at 12:52 on Sunday, 7th March 1943 when a hit-and-run raid of about 16 FW 190s and Me 109s raced in over Beachy Head and ran amock above Eastbourne at 300-500ft. 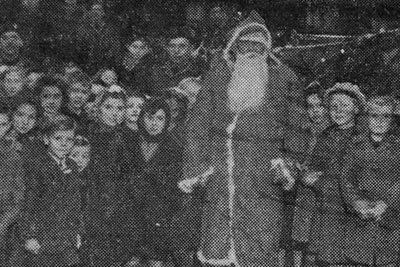 Sixteen 500kg bombs fell on the town that day; 21 people died as a result and 124 were injured, 46 of them seriously. 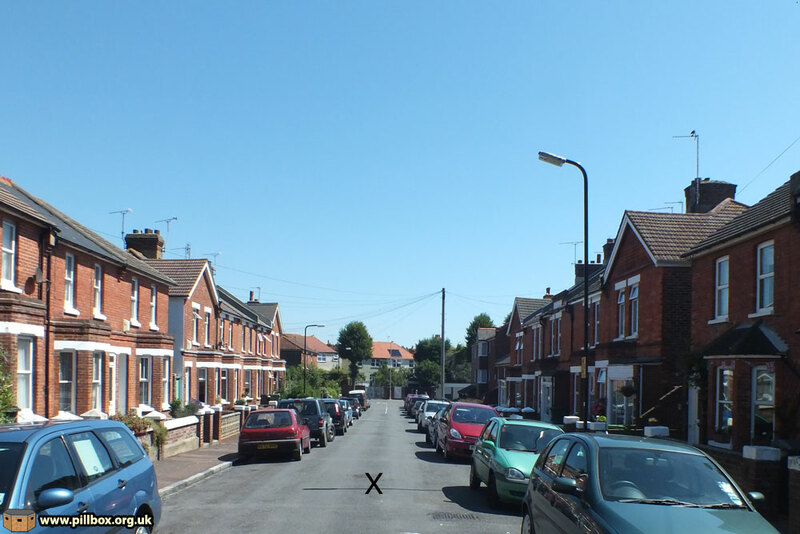 The bomb incident we're investigating begins in Monceux Road as shown in the photo below. The bomb hit the road 246ft from the junction with Green Street at the end of the road (centre background) making a crater 3m across and 30cm deep that I've tried to PhotoShop into the photo; the bomb trajectory is purely speculative. Bomb ricochetted approx. 1350ft and burst in mid-air above Ocklynge Cemetery. Damage done to tombstones etc. Roof of Mortuary Chapel suffered minor damage, also houses in Willingdon Road. It was the reference to damaged tombstones that caught my attention - was there any evidence left? I visited the cemetery with a list of Commonwealth War Graves to photograph for other projects, hoping to see bomb damage as I went round. Two hours later I was almost in despair; despite having a rough idea of where the bomb burst (from the distance it bounced from Monceux Road), I was not seeing anything. Trying to navigate by plots and paths on the cemetery plan was difficult as some of the paths have been lost and it is a big area. I was working on the logic of starting at the estimated location and working outwards so that I would see the gravestones from the direction of attack and would be facing the damaged sides. This didn't bring any results, so I went towards the chapel that suffered damage; none visible today. Turning down a different path to go back to the startpoint, I just happened to glance backwards over my shoulder and I suddenly opened the door into this study by seeing the headstone in the photo at right. 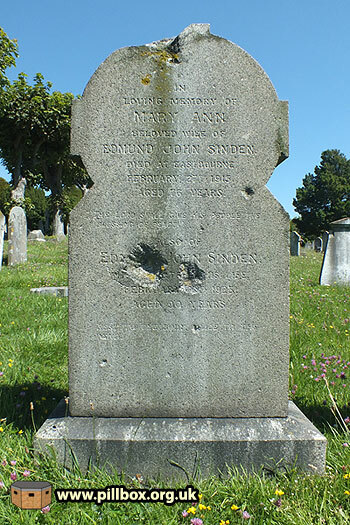 This is undoubtedly bomb damage; splinters of the bomb casing have clearly struck the stone, leaving a series of craters and pockmarks of different sizes and depths in solid granite. 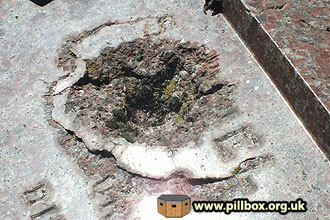 The largest impact is 11cm across, 3cm deep and the top edge has a 21cm-long gash in it. 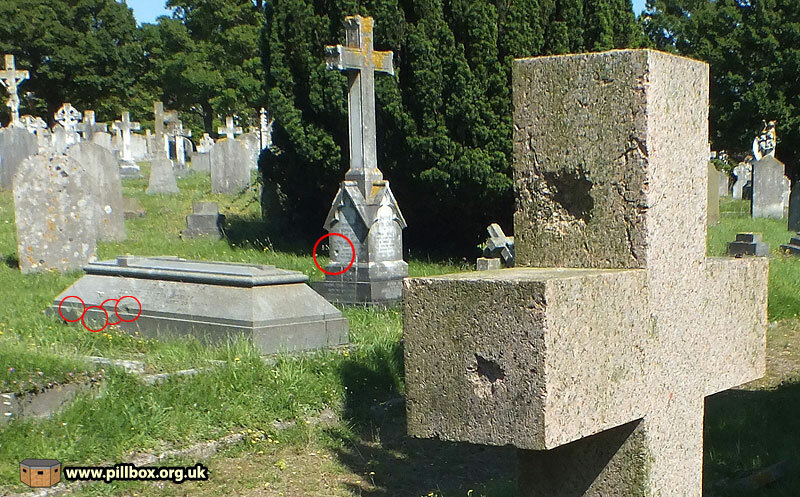 In all, this was the most obvious evidence I was to find in the cemetery, but it opened the floodgates; as the photo below shows, neighbouring stones were also marked, but not quite so heavily as the first one. As I found more and more damaged stones, it became apparent from their alignment and which surfaces had been marked, roughly where the bomb must have exploded. I decided that it would be very useful to record the location and damage to each stone I found in order to help me plot the fallout on a plan. However, only a serious nerd would be stupid enough to do something like that. More and more damaged graves became apparent as I progressed round the cemetery and began seeing clear 'lines of fire' up the grassy slopes. My total so far is 58. The other issue was sunshine; a lot of the damage is really only visible when strong sunlight casts a shadow in the pockmarks. The time of day is important too; I noticed one damaged stone in the morning, and, returning to photograph it in the afternoon, found that the sun had moved round and the mark was no longer visible! I've probably missed some stones as a result of this. It's remarkable that so much evidence still survives to this day - or is it? The local council had no obligation to repair any damage, but I suspect that the War Damage Compensation regulations might have provided limited funds. Otherwise, it would be down to the families concerned to effect repairs and many of the Victorian stones have not been touched, perhaps because none of the family remained in the area to maintain them. I also noted the presence of several Commonwealth War Graves Commission headstones in close proximity to damaged stones. These Great War stones were possibly also damaged, but the CWGC maintains them and so they may have been replaced since 1943. Of the 58 damaged stones identified so far, 25 bore evidence of repair. In most of these cases, I identified these stones solely because of the repair; most of these were alongside known damaged stones. The plan below shows each damaged grave marked by a square symbol. The red arcs are my speculative zones that cover the damage according to my perception of the angle of strike. These arcs are not scientifically described; they're purely observational, but I've used them to speculate the point at which the bomb exploded, marked by the blue 'X'. Note the pink and yellow plots. The pink grave is pockmarked facing uphill (towards the top of the photo); those above this are damaged on their downhill-facing planes. This gives us a bracket within which to work, as the bomb must have been further uphill for splinters to strike that face of the pink stone. 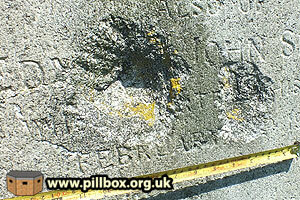 The yellow grave is also significant, and its damage is seen in the photo at right. 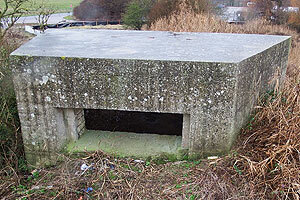 Note the design; the triangular form means that the flanking sides face away from each other. 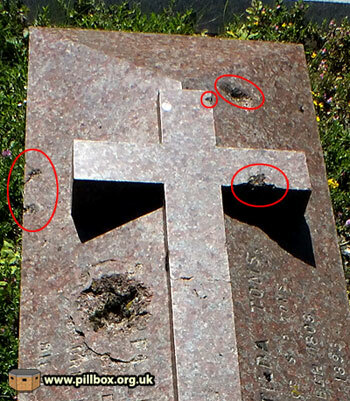 However, we have splinter damage on both sides; this makes me think the bomb was more or less overhead in order to be able to hit both sides of the grave and clear the raised cross in the centre. The large impact is 13cm; the one at top right is 7cm. 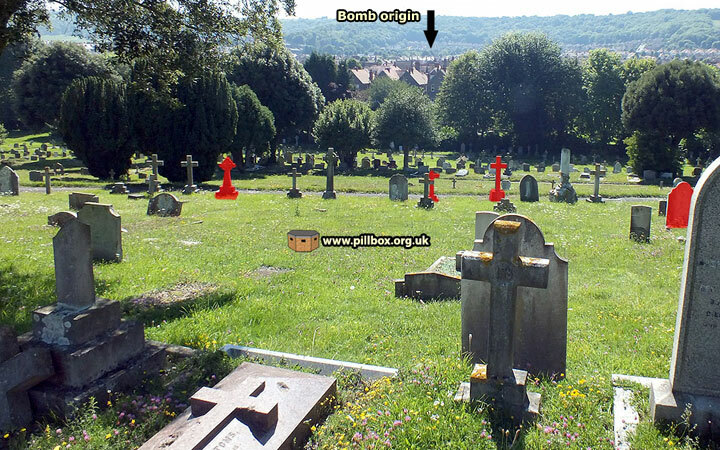 The photo below shows the view with the grave in the foreground, looking along the estimated trajectory of the bomb. The graves coloured in red are those that have damage on their uphill-facing side. Only four graves were found downhill of the bomb with damage; it may be that others have been removed, but most in this plot date to the 1950's and therefore some years after the war. The panorama below is the view uphill from the same spot. Three photos stitched together, the lines indicate the arcs I previously described. 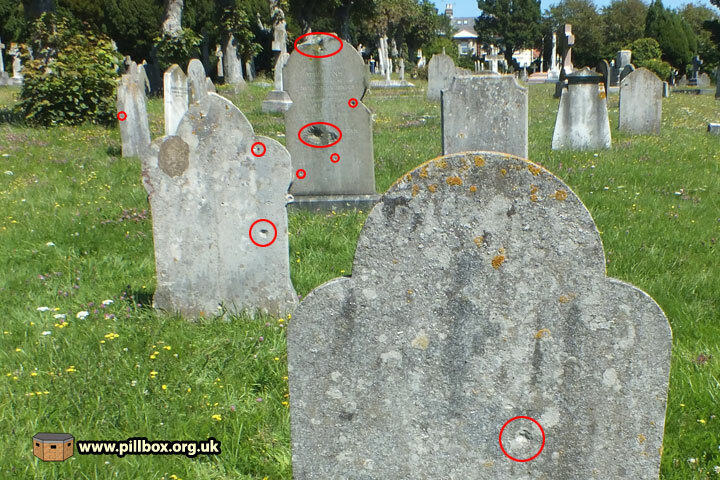 Note how random the strikes are; stones beside damaged ones appear untouched, emphasising the seemingly random nature of the splinter burst. It should also be remembered that the explosion was an air burst, and not at ground level as we see here. There's no further evidence that I've been able to locate in the cemetery; the furthest damaged grave was about 70m away from my estimated detonation point. The chapel is about 120m away while the houses in Willingdon Road are 160m distant, so the splinters still had plenty of force behind them. It seems as though the splinter damage was rising up the hill. Nothing else is known about the distant damage. It was interesting to note that, despite there not being an actual bomb crater, I could locate the approximate scene of the detonation, even if we don't know the actual altitude at which it went off. All in all, this has been a fascinating mini-project and I've been amazed at the evidence still available in the landscape - if you know it's there! This article was a few seconds away from being posted as you see it written above. At the last minute I uncovered one key piece of information - the cemetery bomb actually killed two people. This sad fact came to light as I remembered I had a copy of Front Line Eastbourne, published in 1945 by one of the local newspapers. 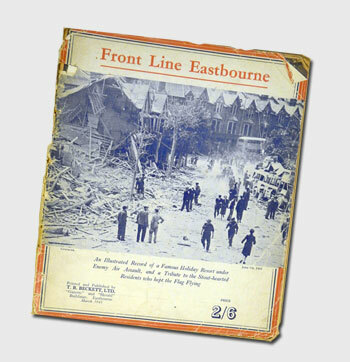 It's odd that the official reports (in two distinct files) omit this casualty information, but another 1945 booklet, Eastbourne 1939 to 1945 (published by another local newspaper) lists only one of the two casualties in its Roll of Honour of "local residents." The Commonwealth War Graves Commission database lists both as being at the same Eastbourne address, so there is no agreement across the sources. The other issue I faced was how I felt about the fieldwork described above; it somehow seemed inappropriate to almost forensically examine the scene at which life was lost. Had I known about the casualties beforehand, then you might just be looking at a few photographs instead of a detailed analysis. This idea in itself raises an interesting question. Should historians shy away from potentially emotive issues and modify or curb their methods of study? Categorically - no! Ignoring controversial/sensitive issues is not a luxury the historian should be afforded - these events happened! However unpalatable or awkward some aspects may be, avoiding them does not make them vanish or change the past. The historian must use the information and resources available to interpret events and put them into context - I hope this is what I've done using the landscape as a source of information. 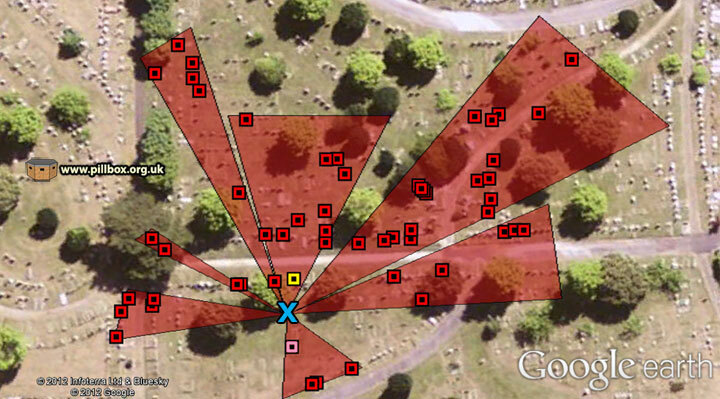 In December 2012, I did a similar investigation at Hove Cemetery.